"Take the "A"Train "is a jazz standard by Billy Strayhorn that was the signature tune oh the Duke Ellington orchestra. It is arguably the most famous of the many compositions to emerge from the collaboration of Ellington and Strayhorn. "Speaking of an unusual live house, there was nothing to be on the right of the <distorted ball temple> that was in Minami Urawa before." I follow the memory of "Hizumi-dama-tei". About 1986 more than 30 years ago, I worked at the Saitama Cancer Center. I forgot about what triggered, but then it was decided to go to the stone pier in the South Urawa with a boss and a head (at that time) and several people at the time. There was a very striking stained glass in the cave that cut out dimly lava, and Mr. Chino owned by the owner came. It seemed to be intimate with my boss. Mr. Chino was a psychiatrist and remodeled the third floor of the home clinic into a live house, which was an unusual baroque space imitating a cave. At that time I did not do live, but I bought a live version LP recorded at Kenny Drew and Red Mitchell's store and came home. There are two records that were recorded at Stone Temple in hand. Quoted from Mr. Chino's distressed pite part as it is from this liner notes. Surprisingly it was a very brief 5 years, because the stone pavilion also endured the 5th age during the day when the psychiatrist night was staying asleep while sleeping. On the day and night of the rebellious counterbalance, the target of the rebellion is only the efficiency and the rational The opponent of the contest of contemporary civilization is gathered at the tea, 18 pianos, 7 people, 7 basses, 12 basses, 9 drums and 10 others others counted There were 13 foreign players. In the meantime, 1 million monthly, 40 million for space creation, 100 million yen afterwards, why have you decided to do such a life? Why did you have to do this life? MJQ I heard 25 years ago Finally, I am at the edge of Art Blakey and then at last I got to make a record like this. 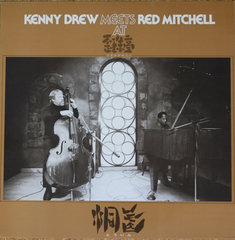 This is the third album Okuri Tatei gives to the world, the first one is a "great song" of the wonderful god sound, the third one is Kenny Drew and the name duo "Dong" of Red Mitchell It is the self-praising that the cave is shining light. "Conscious of hard bop" is a proposition that the creator barrel always thinks of the Renaissance to be regained by myself, the world is the era of maniculand miniature workmanship You are a musical holiday when you are out of power. The idea of ​​a district temple is Salon Barockperle 's greatest creation and integration age of mankind. How to develop a hard bap that denies jazz that has fluttered with a Hollywood capital and emerged as a phoenix butterfly at this district is one subject from the beginning, and jazz is a material that looks from its birth It is a serious explorer of the world, the structure must not be preceded, much less yesterday is the result. Young players and others promoted to small orders of the hostel as well, such as to raise the clear middle and high frequency range of the Bosen Dolpha swinging, whether it is a base ballad as a low-pitched 4-beat convincing bass with swell. I guess I had thrown a glass. How long do they remember about my host when they listen to this record? I probably can not listen to their play at that time. Shikudatei was a shop of Mr. Chino's polite attention. I wonder what time it has gone?